This gorgeous home, the epitome of beauty and grace, has a panoramic view of the spectacular 18th hole at Colliers Reserve. Over a half acre of incredible views and privacy, the home is perfect for entertaining friends and family.Exquisite leaded glass doors lead you to the formal living room, which opens to the solar heated pool, spa and lush landscape. Large sliding doors expand the entire formal and informal living areas to the screened lanai and outdoor kitchen. Two master bedrooms suites, the ultimate in luxury, each have their own spacious bathrooms with soaking tubs. The main master boasts an enormous shower, Toto bidet, and two large walk-in closets.A two-car garage with golf cart bay ensures that the golfers in the family are accommodated. There is an abundance of storage, a feature uncommon in many Naples homes.Colliers Reserve is a unique environment, the first Audubon certified golf community anywhere, and will captivate you from the moment you enter the preserve. 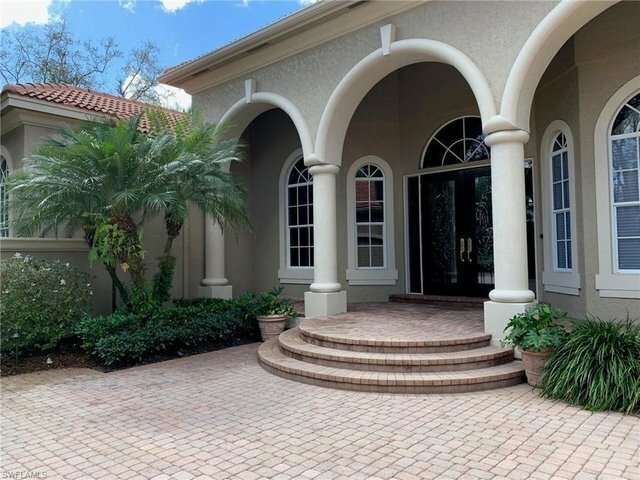 It features an Arthur Hills designed golf course, new state of the art fitness center and racquet center, and a fabulous restaurant headed by one of Naples top chefs. This is a place you will not want to miss.